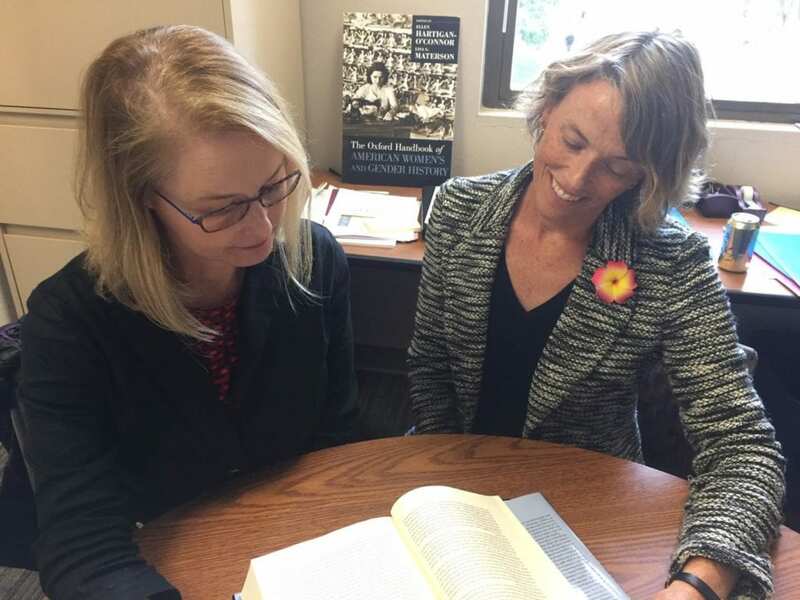 Ellen Hartigan-O’Connor and Lisa Materson of the University of California, Davis, collaborators in research and teaching of women’s and gender history for 10 years, were keenly aware of many fascinating stories about women in history, as uncovered by female historians. But getting those stories into the big narratives of history was more than one or two people could accomplish. Then Oxford University Press asked the UC Davis scholars, both associate professors of history in the College of Letters and Science, to create a women’s history handbook. Oxford publishes definitive handbooks on hundreds of academic subjects, but none had been done on women in American history. So Hartigan-O’Connor and Materson took on the project, determined to showcase not only women’s and gender history, but also the scholars whose intellectual innovation continues to bring women’s stories to life. In a process that included a conference at UC Davis, Hartigan-O’Connor and Materson discussed, sought, collected and edited dozens of historians’ essays on topics ranging from slavery to politics. The resulting book came out in October: The Oxford Handbook of American Women’s and Gender History. Materson and Hartigan-O’Connor introduce the volume of 29 essays by explaining that female historians in previous generations “trained themselves and each other within university departments that were teaching history as defined and dominated by men … and as a result pioneered alternative methodologies and perspectives. From the time of their conference four years ago, Materson and Hartigan-O’Connor knew the handbook would be relevant in today’s society. But they had no idea how timely its publication in the fall of 2018 would be — amid the “MeToo” anti-sexual assault movement and during the run-up to the midterm elections in which women made historic gains. The editors, seizing on the timing of publication, wrote an article for the History News Network after confirmation hearings on the nomination of Brett Kavanaugh to be an associate justice of the U.S. Supreme Court. In “What Historians Could Teach Senators on the Judiciary Committee,” Materson and Hartigan-O’Connor make the point that women’s history is often written from archives that have critical gaps. “The archive is shaped by those who preserve it: Notes can be filed or shredded. Calendars can be preserved or tossed. And whispered confidences can go unrecorded,” they wrote. With their new work, Materson and Hartigan-O’Connor have even more well-researched articles to cite and assign in “Women and Gender in America,” a two-quarter course on the period before 1865 and from 1865 to present. Judy Tzu-Chun Wu, professor and chair of Asian American studies at UC Irvine, said she was honored that the authors asked her to write an essay on some dimensions of the history of feminism. “The essay allowed me to explore the political, economic and sexual dimensions of U.S. feminisms, exploring the significance as well as limitations of these movements and ideas by foregrounding the agency and experiences of women commonly considered marginal to the U.S. nation-state,” she said.